"Paris right now," she captioned this picture. This is the view from Aishwarya's window. Aishwarya also Instagrammed a picture of French player Kylian Mbappe, holding the trophy. Aishwarya and Aaradhya left for Paris earlier this month. The 44-year-old actress shot for Swiss brand Longines' new collection in Paris and after wrapping up the work, the duo are touring Paris and like how. 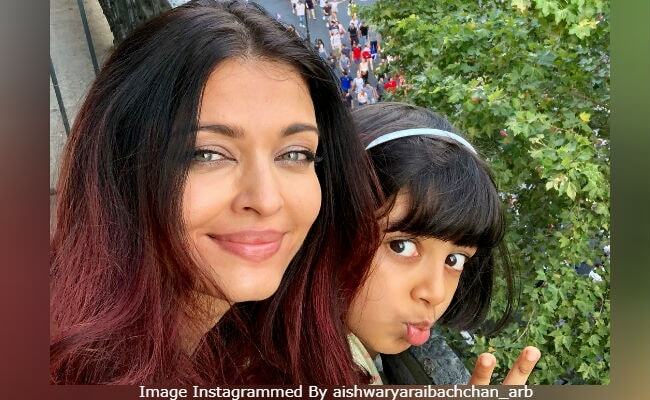 Here are some of the pictures from Aishwarya and Aaradhya's Paris diaries. Meanwhile, Aishwarya's husband Abhishek and father-in-law Amitabh Bachchan watched the semi-finals of the FIFA World Cup last week. Last seen in Ae Dil Hai Mushkil, Aishwarya Rai Bachchan's next film is Fanney Khan, in which she co-stars with Anil Kapoor and Rajkummar Rao. Fanney Khan, directed by Atul Manjrekar, hits the screens on August 3. She is yet to finalise Shree Narayan Singh's Jasmine and the remakes of Raat Aur Din and Woh Kaun Thi?.